Enjoy Beautiful Views of the Smokies on the Gatlinburg Sky Lift! The Gatlinburg Sky Lift takes riders on a spectacular 500 feet journey to the top of 1,800 foot high Crockett Mountain. At the top of the lift, the chairs slowly circle back around for the exhilarating and scenic trip down the mountain. The area is surrounded on three sides by the natural beauty of Great Smoky Mountains National Park where you can view the lush forests and stunning mountain vistas! The Gatlinburg Sky Lift opened in 1954 and fell victim to the wildfires that devastated Gatlinburg and the Great Smoky Mountains on November 28, 2016. The entire area surrounding the attraction was burned, with the most severe damage at the top of the mountain with the sky deck and gift shop. 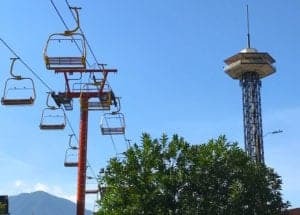 Prior to the wildfires, the owners of the Gatlinburg Sky Lift had talked about upgrading the lift chairs from two-seaters to three-seaters. Once the damage had occurred, a decision was made to make the upgrade and a new set of 92 yellow chairs were installed. Although the construction of the new Sky Deck observation area is still underway, visitors can once again ride this iconic Gatlinburg attraction! The Gatlinburg Sky Lift opens daily at 9 AM and closes anywhere between 9 PM and 11 PM depending upon the season. Note that hours and operations are weather permitting, so feel free to contact the Gatlinburg Sky Lift prior to your visit by calling (865) 436-4307. The current pricing is $16 per ride for adults, or unlimited rides for a day for just $18! Child tickets are $13 per ride or $14 for unlimited rides. There are also military discounts available so be sure to bring your military ID for a reduced price! The Gatlinburg Sky Lift is conveniently located at 765 Parkway in downtown Gatlinburg! There are plenty of parking facilities within easy walking distance of the attraction. If you want to stay in the best cabin rentals near the Gatlinburg Sky Lift, check out Aunt Bug’s Cabin Rentals! We have a wide selection of affordable cabins ranging from one bedroom for a romantic getaway to 8 bedrooms for a fun group vacation. All of our cabins include fantastic amenities designed for a perfect getaway, including full kitchens, game rooms, hot tubs and more! Come find out for yourself why guests love staying with us for their Smoky Mountain vacation! Take a look at all of our cabins in Gatlinburg today to stay near the Gatlinburg Sky Lift! We hope to see you soon at Aunt Bug’s cabin Rentals!